I have the biggest soft spot for big old broughams. I will moan and groan for days about how my compact Mitsubishi Lancer is too big for modern city driving, yet the strange coolness of a classic land yacht cannot be denied. They’re big, they’re wasteful, and they’re hilariously gaudy, but nothing eats up the miles on a long road trip quite like an old American luxury land yacht. Yes, you’re killing the environment, but the environment will not have died in vain, because just look at how comfortable you are. The Eldorado’s seats have actual pillows built into them, for Pete’s sake. 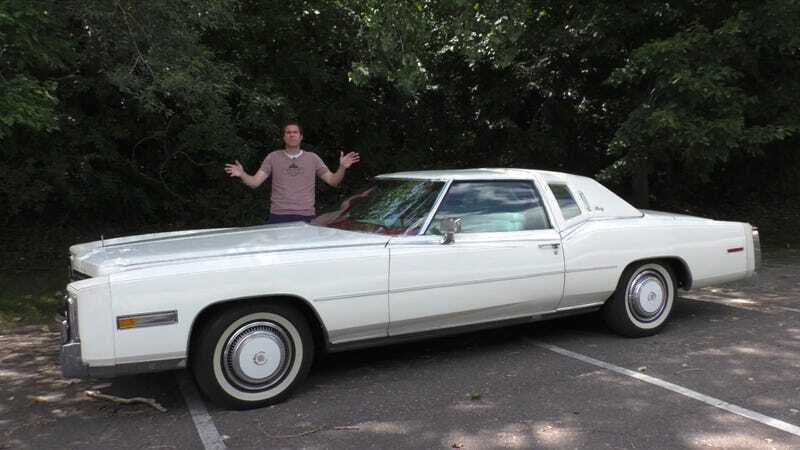 This 1977 Eldorado is the ultimate expression of that 1970s id. It’s showy. It’s opulent. And it’s all about the driver, despite having room for six—albeit not driver-focused in the way we usually think of it. When we think of a car as “driver-focused,” we usually think of cars that are involving and fun to drive, or perhaps of the old BMW center consoles that angle towards the driver. Not so much here. The 1977 Eldorado’s interpretation of “all about the driver” was instead to put the HVAC controls where only the driver can reach them, and to load the car with neat little gadgets, like the light indicators on the fenders, or the thermometer on the stalk for the hilariously small rear-view mirror. I always heard the Eldorado described as the ultimate car for a well-to-do bachelor—as in, a car made for singles. Because you, dear driver, are the only person here who matters in this car. You’re taking up a physical space on the road that’s a full two and a half feet longer than a modern Ford Explorer, all just for you. If you have all the time in the world—a true luxury in its own right—it doesn’t matter that this car is hilariously slow or ill-handling. You’ll arrive when you arrive, probably fashionably late. The 1977 Eldorado is a car that doesn’t make sense to modern drivers, nor should it. It’s good that we’re now tempering our basic desires for comfort against more pressing concerns, like the need to power our personal comfort/travel-pods with more efficient, cleaner engines. But I do appreciate that something this absurd still exists. Which New Car Most Needs a Brougham Edition?